Ethy-Gen® II’s active ingredient is all-natural & GMO-free! Specially formulated by Catalytic Generators, Ethy-Gen® II is the efficient and clean way to convert to ethylene. You may have heard it called “ripening fluid,” because that’s exactly what it does. Simply pour it in or connect it to one of our generators, and watch the safest and most effective consistent ethylene production begin. Since we manufacture Ethy-Gen® II with only the purest ingredients available, there are no harmful byproducts produced when converted to ethylene in one of our Catalytic Generators. Don’t be fooled by copycat “ripening fluids.” Ethy-Gen® II is stringently tested for purity so that you can be assured of the quality of ethylene emitted by the generator (and NO harmful byproducts!). 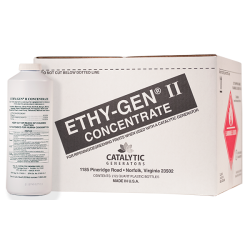 So you can be sure of the purity, safety and effectiveness of what comes out of the ethylene generator when you only pour in Ethy-Gen® II! Ethy-Gen® II is sourced from grain not petroleum, making it more environmentally friendly and from renewable sources. Ethy-Gen® II and the compounds emitted from its conversion through a catalytic generator have been extensively tested by a third party and are approved as proper for the use in ripening fruit. Don’t use untested and unapproved ingredients; these may result in inferior and unsafe by-products! Ethy-Gen® II is fully labeled and batch numbered for traceability. Also, ethylene is odorless and without measuring the level in the room, there’s no way to know it is present in the ripening room. No ethylene = no ripening. That’s why ethylene created from Ethy-Gen® II has a slight sweet smell…letting you know it is there, doing the work to help make delicious fruit. Contact us for pricing and fast delivery. We’ve improved the packaging for one of our most popular products, all for your convenience. *Remember that ethylene is explosive at 27,000 ppm; always use our generators in ripening rooms that is are 43m3 or larger. Our products, when used as directed, cannot produce explosive levels of ethylene in commercial ripening rooms.